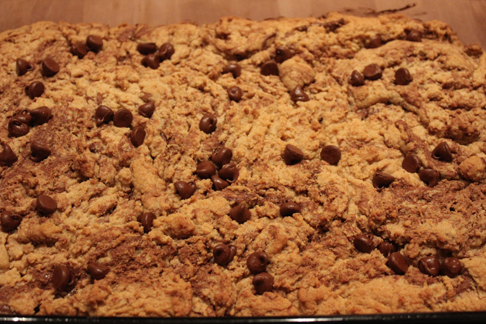 As much as I love apples and fruit based desserts, the hubby was begging for blondies. I couldn't do the same ol' thing, so it's time for another twist on a classic recipe. 1. Preheat the oven to 350 degrees F. Grease a 9x13 inch pan and set aside. 2. 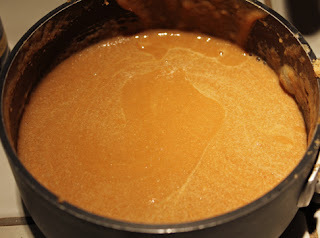 In a saucepan over medium heat, melt the butter and brown sugar, stirring constantly until smooth. Remove from the heat and stir in the peanut butter, until creamy and combined. Set aside mixture to cool. 3. In a large bowl, whisk together flour, baking powder, baking soda and salt. 4. Add the eggs, one at a time to the peanut butter mixture, mixing well after each addition. Add the vanilla extract and stir to combine. Pour the mixture into the prepared dry ingredients, and stir until the batter is smooth. 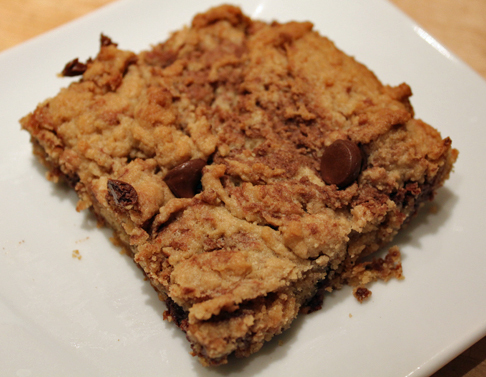 Fold in 1/2 cup of the chocolate chips, reserving the rest for sprinkling on top. *My peanut butter mixture was still a little warm, so some of the chocolate chips melted into the batter. I think it actually had a cool effect (swirling the batter), and still tasted delicious, so I didn't mind. If you do want to keep your chips whole, make sure the mixture has cooled completely before mixing in. 5. Transfer the batter to the prepared pan, spreading the batter evenly to the edges of the pan. 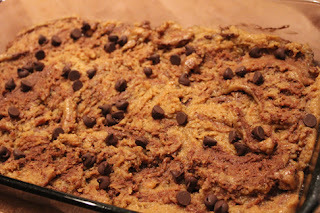 Sprinkle with the remaining 1/4 cup chocolate chips and lightly press them into the batter. 6. Bake for 25-30 minutes or until the top is golden and the edges are slightly browned. Remove blondies from oven and place them on a wire rack to cool. Once cooled, cut into squares and serve.